Interested in selling excess New or Used Cisco 7800 Series IP Telephones? If your organization has recently completed a phone system upgrade or moved to a new PBX or hosted platform, contact our purchasing staff today for a fast, competitive quote to purchase your excess inventory of Cisco 7800 Series handsets. The Cisco 7800 Series is comprised of a selection of desktop, conference and wireless IP telephones to suit the communications needs of any business. Cisco 7800 Series telephones come standard with multi-line support for efficient call handling, high res grayscale LCD display and hands free full duplex speakerphone. 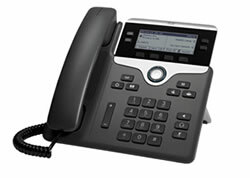 Cisco 7800 Series handset also support HDVoice wideband audio codec for excellent call quality. These phones work with a variety of Cisco IP Communications systems, as well as 3rd party hosted and premise based PBX systems. 7800 Series telephones also offer Power over Ethernet, Integrated IEEE 10/100 switch and SparkPhone OS. NetEquity.com Buys, Sells, Trades and Consigns Cisco 7800 Series IP Telephones. If you are an equipment seller or potential buyer interested in pricing, we can help! Contact us today for a quote. Need a quote to Buy New or Refurbished Cisco 7800 Series IP Telephones? We can provide you with a competitive quote and fast turnaround to meet your network and budget requirements. NetEquity.com maintains a large standing inventory of New and Professionally Refurbished Cisco 7800 Series phone models and accessories at deep discount prices. To get started, simply contact a NetEquity sales representative today via phone or web form and let us know the quantity and condition of telephones you are interested in. NetEquity Refurbished Cisco 7800 Series IP Telephones are professionally remanufactured to Grade A Cosmetic Condition, fully tested by Certified Engineers and reset to Factory Default settings. Our Refurbished Cisco 7800 phones include New handset cords and RJ45 patch cables, and are ready to install out of the box. In addition to offering extremely competitive pricing on Refurbished Cisco 7800 Phones, we also offer a full 1-Year replacement warranty for End Users on all Refurbished Cisco products. We also maintain a very large standing inventory of the most popular Cisco IP Telephone models and accessories, ensuring that we have what you need IN STOCK, with no long lead times. NetEquity.com wants to buy your used, excess or end-of-life Cisco 7800 Series VoIP Phones. If you've simply outgrown your Cisco 7800 Phones and are interested in a trade-in or upgrade, we can help. Contact us today to sell, consign or trade your unwanted Cisco 7800 Series telephone equipment.